Fast and reliable in increasingly smaller spaces: Rollon’s components and complete mechanical solutions make shuttles and stacker cranes more efficient, and sustain the growth of a quickly growing sector. In a market worth tens of billions of dollars, shaving off one second or one centimeter can make a big difference. Especially in the intralogistics sector, the root of the e-commerce revolution, growth in recent years has developed at the same rate as automated processes have improved warehouse efficiency. Reliability and speed in smaller spaces: this short phrase sums up the winning approach behind a truly efficient warehouse during this explosive era of e-commerce growth.Rollon can definitely achieve this result through its extremely wide range of products and specific know-how gained in customizing solutions to respond to the different needs of single applications in all areas of intralogistics. Today, shuttles run unceasingly between the shelves of automated warehouses carrying Rollon telescopic rails to manage the extraction process, picking products from shelves and placing them elsewhere. This crucial process is repeated millions of times. Therefore, it is fundamental that these telescopic rails have the right characteristics. Which features do they need? Cross-section dimensions: a difference of one centimeter on a single rail is multiplied by thousands of slots along shelves that are hundreds of meters in length, and this turns into meters or tens of meters of space available for new slots. A properly sized rail, like ASN, means that the warehouse can store more objects in the same amount of space. Rigidity: the extraction system must be extremely rigid. Telescopic rails used in these applications must have extremely limited play (two-place decimal tolerance) or a total absence of play. In this context, Rollon brand products are particularly efficient: for example, the ASN telescopic rails have induction hardened raceways that allow them to maintain coupling and preserve rigidity. Double and over-extending strokes: shuttles need to extract products in two directions, and Rollon solutions such as ASN and DE telescopic rails allow them to do that, thanks to the double stroke configuration option. Another issue is that, in order to reach more distant products, shuttles require a stroke with rails that are longer than the usual 50%. With Rollon rails, strokes can be extended up to 75%. If two pairs of two-stage extraction rails are used, a total extraction of 150% of the width of the shuttle is achieved. Synchronization: to meet the needs of clients and offer a synchronized product, Rollon has proven that it is an expert at customization. Starting with the DE telescopic rails, the Group has created a personalized solution: the DEF43Z, a synchronized rail with a rack and pinion mechanism. However, Rollon’s customization abilities can even go further to provide mechanical systems integrated with personalized components that meet the client’s specific needs. These components range from belt mechanisms for synchronization to ground raceways for further improving sliding movements. 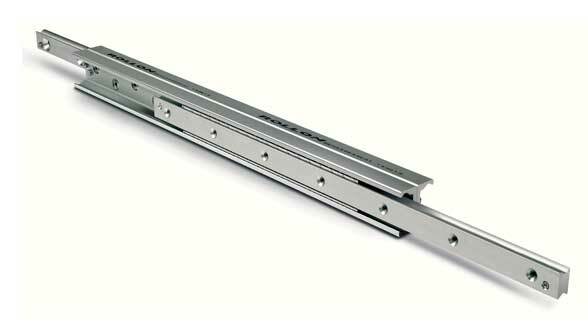 They also include rails with ball bearings integrated into a special intermediate element that can guarantee maximum rigidity. In the filed of intermediate rotation, stacker cranes are systems that run on both a horizontal and vertical axis to reach products on warehouse shelves. Due to evolutions in its product range and recent corporate acquisitions that have fostered its growth in the linear actuator sector, Rollon is now able to offer complete solutions for stacker cranes, formed by an X-axis and a Z-axis, ideal for managing small and medium-sized loads.In this case, the right products to use are belt-driven actuators from the Smart System family, which guarantee speed and high acceleration along with no need to lubricate the belt. This combination provides the perfect solution for stressful work cycles. Smart System actuators are also supplied with all mounting accessories and fasteners needed for simple, quick integration between products, to allow the fast, easy assembly of an efficient stacker cranes. Over the years, Rollon products have been confirmed as reliable reference points also in vertical warehouses. 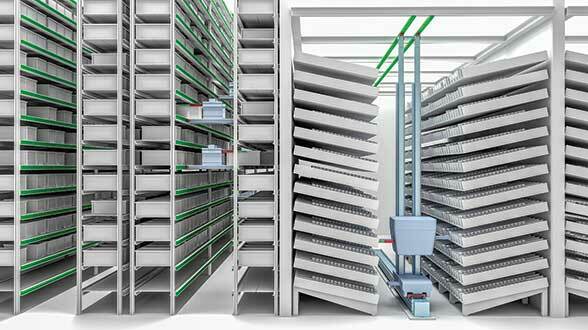 This systems make it possible to store materials on different shelves and to move them with automated means to make them accessible to the ground. This is where Rollon’s DSS telescopic rails come in handy. Thanks to their high load (up to 500 kg per pair of rails) and low degree of bending, they allow the operator to extract the tray holding the materials and to re-insert it inside the drawer easily.